I have been curious about the “new” blues scene for quite some time. UK’s Classic Rock magazine often does features on new and old blues musicians so it got me interested and I figured I might as well start with the scene’s current modern marvel Joey Bones (or JoBo, if you prefer). While I don’t know how this compares to Bonamassa’s previous efforts, Dust Bowl is all that a current blues-guitarist’s album should sound like. While it’s fairly standard for blues artists to cover old blues songs (only half the album features original material), I think I would get very bored if this album was just a repeat of songs from decades and decades ago. Luckily, Joe isn’t content to merely dig up the past. Fans of Stevie Ray Vaughan will enjoy this album a lot as that is who I am reminded on songs like “Slow Train” and “You Better Watch Yourself”. 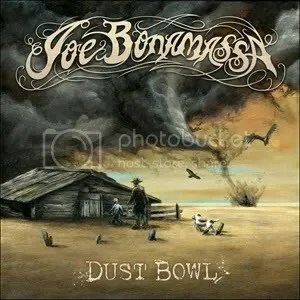 Still, Joe’s own style shines through with “Dust Bowl” (my favorite track and the most accessible), the ballad “The Last Matador of Bayonne” (which sounds like it could’ve been on one of Black Country Communion’s albums), the excellent “Black Lung Heartache” (which start off sounding like bluegrass then turns into hard rock) and “The Whale That Swallowed Jonah”. Another high point on the album is “The Meaning of the Blues”. A lot of passion behind that song and it is the epitome of a great blues song, IMO. Despite Joe being known primarily as a blues rock guitarist, country/folk music and classic rock have their places on this album. John Hiatt’s “Tennessee Plates”, Vince Gill’s “Sweet Rowena” and Free’s “Heartbreaker” are all covered. Hiatt and Gill both pitch in on their respective songs while “The Voice of Rock” Glenn Hughes lends his voice to “Heartbreaker” and again this is a song that could’ve ended up in BCC. Heck, Joe even covers Tim Curry’s “No Love On The Street” with Beth Hart lending vocals. I never even knew Cardinal Richelieu had an album… much less three! I always thought his musical experiences were tied only to the theater and Rocky Horror Picture Show. In the liner notes (where he comes across as very likable, down-to-earth and funny), Bonamassa states this is his best album yet. Hey, aren’t the latest releases always the “best yet”? While he kinda has to say that and I’m still a novice when it comes to Joe, he may be right. This is a very good collection of original material and some choice covers. I’d love for his next album to feature and even higher percentage of original numbers with maybe just one or two covers thrown in. Blues rockers will really enjoy this one and it makes me wanna pick up Joe’s earlier albums. Buy ‘Dust Bowl’ from Amazon.com!